You are here: Home / News / Here’s why everyone should be wearing an ICE-TAGS ID Tag. 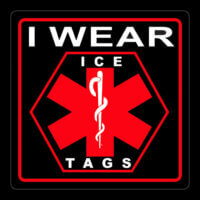 Here’s why everyone should be wearing an ICE-TAGS ID Tag. Here’s the thing about life threatening emergencies, we can never predict when we’ll have an accident or be caught up in any other life threatening situation. Injuries can occur in many scenarios, but no matter when or how injuries are sustained, if they’re traumatic enough to threaten your life, the only thing you can do in preparation is to wear an ICE-TAGS ID tag. Our kids with allergies aren’t always under our supervision, which leaves them susceptible to allergic reactions that in some cases may be life threatening. Food allergies are particularly dangerous in underage children as many foods may contain the substance the child is allergic to. Toddlers with allergies should also definitely be wearing an allergy bracelet. Whereas an older child can still tell someone they have an allergy to an insect bite or food, a toddler isn’t able to do so. The way that food is processed today also leaves adults in a precarious position if they have allergies, especially when one is a little more adventurous about tasting new foods. Should you have an allergic reaction, especially if you go into anaphylactic shock, medical personnel will need to know so that you’re given the appropriate treatment. When you’re in a critical condition as a result of trauma, medical personnel will want to contact family and friends. This is sometimes vital when your life is hanging in the balance. Having someone who loves you at your side has made all the difference in many cases. Besides which, none of us would like to be listed as a John Doe or Jane Doe! The more information medical personnel can glean from family and friends, the better your chances will be. Medical bracelets for kids or adults gives medical personnel vital information about any illnesses you or your child may have, which will significantly heighten your chances of receiving the right medical treatment. All first responders and medical personnel are trained to look for any emergency medical bracelets on the patient before they undertake any medical treatment. These ICE-TAGS (In Case of Emergency) products are all featured in the comprehensive range of products that have passed stringent tests out in the field, in order to make sure they can withstand all conditions. ICE-TAGS South Africa is the #1 supplier of allergy bracelets for kids, ICE bracelets, ID Tags, medical bracelets and much more. The team at ICE-TAGS is passionate about preparing people for all emergencies, and will go the distance in assisting anyone ready to make sure they’re covered in case of an emergency. Contact ICE-TAGS today to find out more about other safety and security products such as the ICE-CAMS PRO for motorbikes. If you’ve already got your ICE Identification Tag, why not give the ultimate gift to a loved one by giving them an ICE-TAGS Gift Voucher – there’ll be no wriggling out of wearing this most important accessory then! For a minimum Premium per Month benefits will include access to essential services In Case of Emergency.